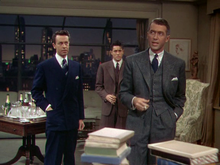 James Stewart as Rupert Cadell, John Dall as Brandon Shaw and Farley Granger as Phillip Morgan. By what right do you dare to say that there's a superior few to which you belong? By what right did you decide that that boy in there was inferior and could be killed? Rope is a 1948 film about two young men who commit a murder just to see if they can get away with it, then hold a party with the body hidden inside a chest that serves as the centerpiece in their living room. As the evening continues, their old teacher begins to suspect foul play. Directed by Alfred Hitchcock. Adapted by Hume Cronyn and Arthur Laurents from the play Rope's End by Patrick Hamilton. Rupert is extremely radical. Do you know that he selects his books on the assumption that people not only can read but actually can think? The good Americans usually die young on the battlefield, don't they? Well, the Davids of the world merely occupy space, which is why he was the perfect victim for the perfect crime. We killed for the sake of danger and for the sake of killing. Nobody commits murder just for the experience of committing it. Nobody except us. Of course, he was a Harvard undergraduate. That might be grounds for justifiable homicide. The power to kill could be just as satisfying as the power to create. You're quite a good chicken strangler as I recall! By what right do you dare to say that there's a superior few to which you belong? By what right did you decide that that boy in there was inferior and could be killed? Did you think you were God, Brandon? Is that what you thought when you choked the life out of him? Is that what you thought when you served food from his grave?! I don't know who you are but I know what you've done. You've murdered! You choked the life out of a fellow human being who could live and love as you never could, and never will again! I never strangled a chicken in my life! Mrs. Atwater: Do you know when I was a girl I used to read quite a bit. Brandon Shaw: We all do strange things in our childhood. Brandon Shaw: [to Rupert] It's awfully good to see you again. Rupert Cadell: Brandon has told me a lot about you. Janet Walker: Did he do me justice? Rupert Cadell: Do you deserve justice? Kenneth Lawrence: We're drinking champagne? Is it somebody's birthday? Brandon Shaw: You might say it's quite the opposite. Janet Walker: Well, now, you don't really approve of murder, Rupert? If I may? Brandon Shaw: Determined to get drunk, aren't you? Phillip Morgan: I am drunk. Brandon Shaw: And just as childish now as you were earlier when you called me a liar. Phillip Morgan: You had no business telling that story. Brandon Shaw: Why did you lie anyway? Phillip Morgan: I had to! Have you ever bothered for one minute to consider how another person might feel. Have you considered the feelings for others? Phillip Morgan: No, that's not what I mean; but it doesn't matter. Nothing matters... except that Mr. Brandon liked the party. Mr. Brandon gave the party. Mr. Brandon had a delightful evening. Well, I had a rotten evening! Brandon Shaw: Keep drinking, and you'll have a worse morning. Phillip Morgan: At least if I have a hangover, it will be all mine! Brandon Shaw: What are you doing? Rupert Cadell: It's not what I'm going to do, Brandon. It's what society is going to do. I don't know what that will be, but I can guess, and I can help. You're going to die, Brandon. Both of you. You are going to die. It's his most nerve-stretching thriller! It begins with a shriek... It ends with a shot! This page was last edited on 25 January 2019, at 05:18.